April 13th from 5 to 7pm for an intimate art reception with Miami artist Cristina Lei Rodriguez. Check out internationally acclaimed, Miami artist Cristina Lei Rodriguez’s POP UP on the second floor of Paradise Plaza. Her contemporary, colorful art takes many forms- sculptures, paintings, prints and design, but is always quintessentially Miami. Her work is organic and minimalist, echoing a tension between the natural and the artificial. The art Rodriguez creates is abstract, made from common materials that are given a new intangible life. 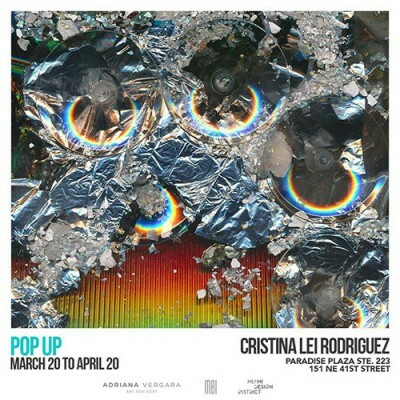 Cristina Lei Rodriguez’s art exhibition POP UP will be on view through April 20th on the 2nd floor of Paradise Plaza next to Vanity Projects. The space is open from 12 – 5 pm everyday or by appointment. Contact Adriana Vergara Art Advisory at adriana@adrianavergara.com for more information.